For Surviving Nuclear Blast and Radiation Threats with FREE fallout shelter plans, books, guides & ready made fallout shelter sources! Cold War Relics or Tomorrow's Family Life-Savers?!? Q: What is the Purpose of This FAQ? Since the launching of those FAQ's, before 9/11 in 1999 and early 2001, we'd had a steady stream of inquiries and requests for info on nuke bomb blast and fallout shelters. 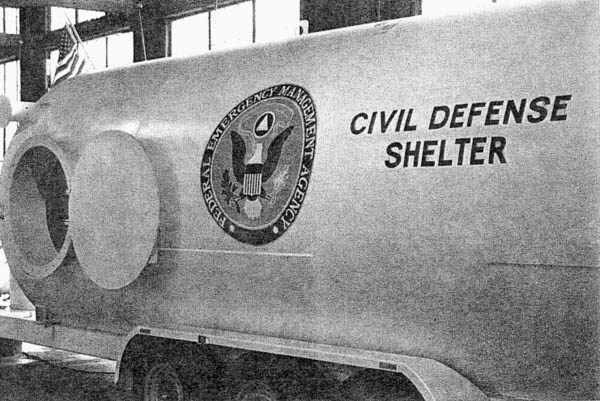 We had linked to numerous FEMA fallout shelter plans and Civil Defense resources and always hosted at our sites the entire 280 page Nuclear War Survival Skills book and some FEMA and Civil Defense books free on-line there, too. The next logical step, with this growing public interest, was this comprehensive FAQ web site where we've brought together under one roof all of these resources, and many more, while answering the most Frequently Asked Questions about practical nuclear sheltering. As with researching potassium iodide and its use in nuclear emergencies for the ki4u.com FAQ and then later the radiation meters for the RadMeters4U.com FAQ site, we found much fiction, misinformation, and critical omissions overwhelming the few solid facts. What we've discovered, and share below, from the pioneers, engineers and todays leaders of nuclear shelter building, will both dispell the myths and show the practical steps you can take to protect your family today, right now! It is not an overstatement, that what has been distilled down and presented here will actually save the lives of many families who study the realities of nuclear explosions, accidents and radiation and then take from it the appropriate measures readily available to protect themselves from it. Nuclear war, accidents, terrorism and radioactive fallout are all much more survivable when you know exactly what you are up against and how to properly defend yourself and your family from its effects. It not only can be done, but even with very limited resources you can raise your families odds of surviving 100 fold simply by reading, learning and applying what's presented here below. And, for most, that's all the edge they'll need! Q: Who Needs Nuclear Protection Sheltering Strategies? A: The reasons for learning about and formulating a family nuclear response strategy are as varied as are peoples perceptions of the most likely threats to their loved ones in this ever changing world. The following all-inclusive list would require different responses (sheltering or evacuation) depending on the particular nature and location of the threat and your ability and preparations to respond to it. While only a few of the potential nuclear threats above would entail blast damage, all would involve possible radiation exposure and some with actual radioactive fallout that the wind had then carried far from the original scene of the incident. Many variables will determine the nature of the nuclear threat and the level of protection needed at varying distances from ground zero. For instance, for atomic bombs, whether it was a ground burst or air burst will determine whether there is significant fallout or not. Also, the explosive yield of the bomb, which is typically measured in kilotons (KT) or megatons (MT) of an equivalent quantity of TNT, will determine its blast circumference damage area. 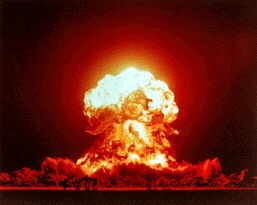 (A one-megaton bomb is 1000 times more powerful than a one-kiloton bomb.) Another effect is the thermal pulse or heat flash that can burn exposed people and ignite combustible materials. These direct effects, the blast wave and thermal pulse, are examined first below here. Then, following that, the radiation effects, both the initial radiation and fallout radiation are detailed. Bottom Line: Exploring and developing your nuclear response strategies in this day and age is cheap family insurance and, like major medical insurance, we can also hope & pray never to have to use it! Also, like any real insurance, it'll be near impossible to quickly figure it all out and implement it after the fact! Knowledge is King here while a false embrace of nuclear un-survivability myths could be downright deadly. Q: What are the Nuclear Blast and Thermal Pulse Effects? Obviously, the bigger the weapon yield the larger the area of overpressure damage from the blast wave. But, notice that the damage range does not increase in a linear fashion with the more powerful explosions. For instance, comparing the 200 KT air burst with the five times more powerful 1 MT air burst, the range of moderate damage and initial fires increased from only 4.3 miles to 7.3 miles. This is because the reach of blast and fire effects varies as the cube root of the weapon yield ratio and the cube root of 5 is 1.71. So, instead of a five-fold increase or 500% we have only about a 70% increase in this comparison. This is important to keep in mind when you hear people throwing around numbers of how much greater the damage will be from a larger bomb. A readily portable terrorist nuclear bomb would likely be only a fraction as powerful as the examples above, but for reference, the Hiroshima nuclear bomb was only a 15KT air burst. (The RA-115 backpack nukes reported missing from Russian stockpiles are one kiloton yield each, and they would most likely be surface exploded.) The govt is expecting if we see a terrorist improvised nuke exploded here, it would likely not be much more than 10 kilotons. The National Planning Scenario #1, an originally confidential internal 2004 study by the Department of Homeland Security, examined the effects of a terrorist nuke going off in Washington, D.C.. They discovered that a 10 kiloton nuke, about 2/3rds the size of the Hiroshima bomb, detonated at ground level, would result in about 15,000 immediate deaths, and another 15,000 casualties from the blast, thermal flash and initial radiation release. As horrific as that is, the surprising revelation here is that over 99% of the residents in the DC area will have just witnessed and survived their first nuclear explosion. Clearly, the good news is most people would survive the initial blast. Read The Good News About Nuclear Destruction! for more details! As noted above, blast effects drop off quickly with distance. At Hiroshima a brick building survived only 640 feet from ground zero. And less than a mile away a trolley car remained intact and on its tracks. For concerns of a future Soviet attack, the current thinking is that with the continuing trend towards more accurate MIRV'ed (multiple, independently targetable, re-entry vehicles) nuclear weapons, they are now mostly smaller than in the past, averaging on the order of 500 KT or less and for submarines only 200 KT. Of course, there are now more warheads per missile (4-10) and they are substantially more accurate than during the height of the cold war. Also, any targeted military installations can expect to receive multiple hits. All buildings will suffer light damage from the shock wave at even 1 psi peak overpressure--shattered windows, doors damaged or blown off hinges and interior partitions cracked. The maximum wind velocity would be only about 35 miles per hour. As the overpressure increases, so does the blast wind--exceeding hurricane velocities above about 2 psi. So, how much blast or overpressure is too much to survive? It, of course, depends on where you are when it comes charging through, but from a 500 KT blast, 2.2 miles away, it'll be arriving about 8 seconds after the detonation flash. (An even larger 1 MT blast, but 5 miles away, would give you about 20 seconds.) Like surviving an imminent tornado, utilizing those essential seconds after the initial flash to 'duck & cover' could be the difference between life & death for many. Both the overpressure in the blast shock wave and the blast wind are important causes of casualties and damage. Again, though, as in a tornado, prompt protective actions can make a great difference in ones survivability. For example, it requires about eight times the blast wind force to move a person who is lying down compared to a standing person. Diving into a ditch, depression, basement or anywhere else normally thought of for tornado protection will improve your odds greatly. You are also much less a target for glass shards and debris missiles. This simple change in vulnerability, but of this magnitude, can save many lives. Unfortunately, most now ridicule 'duck & cover', but for the vast majority, not right at 'ground zero' and already gone, the blast wave will be delayed in arriving after the flash, like lightening & thunder, anywhere from a fraction of a second up to 20, 30, 60 seconds, or more. 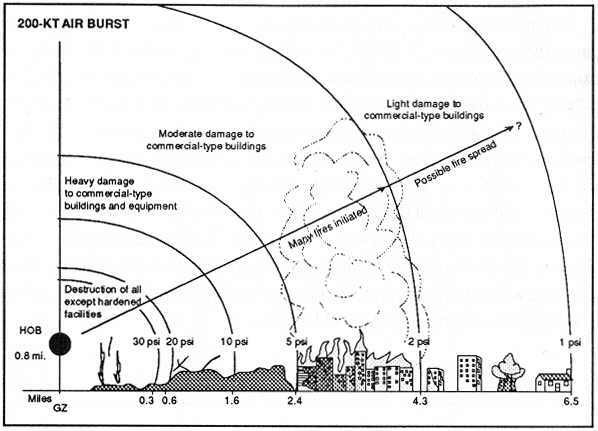 Today, without 'duck & cover' training, everyone at work, home, and your children at school, will impulsively rush to the nearest windows to see what that 'bright flash' was, just-in-time to be shredded by the glass imploding inward from that delayed blast wave. They'd never been taught that even in the open, just laying flat, reduces by eight-fold the chances of being hit by debris from that brief, 3-second, tornado strength blast. Regarding the Thermal Pulse that accompanies the thousand suns brighter flash, that represents 35% of the energy expended in a nuclear explosion, burns caused by this heat energy of the fireball can produce the most far reaching consequence of the immediate weapons effects. For our example above of the man-in-the-open, 2.2 miles from a 500 KT air detonation, fatal blast injuries would have served in most cases to put him out of his misery. The thermal pulse, travelling at the speed of light, would have already delivered lethal burns and his clothing would have burst into fire if truly exposed in the open. In fact, about 50% of those fully exposed to the fireball anywhere in the 2 psi or greater range would eventually die from the severity of their burns. "Look down and away from the probable source, and quickly get behind anything that will shield you from most of the thermal pulse's burning heat and intense light. A thermal pulse delivers its heat and light for several seconds-for more than 11 seconds if it is from a 1-megaton surface burst and for approximately 44 seconds if from a 20-megaton surface burst." Quote from page 24 of Nuclear War Survival Skills, Updated and Expanded 1987 Edition, by Cresson H. Kearny, (original edition published by Oak Ridge National Laboratories in 1979). However, if there is fog or haze or any kind of opaque material or structure between people and the location of the fireball the effects of the thermal pulse can be greatly reduced. With medium haze it can be cut by 50% and with heavy fog down to even just 10%. So, smog in the big cities could actually be partly protective for once. Also, while it arrives at the speed of light and delivers most of it's energy within the first second, the larger the bomb the longer it'll take to deliver its full compliment of thermal energy, perhaps even several seconds. Quickly diving behind anything creating a shadow could be lifesaving. In most places however, besides fog, smog, haze or clouds, there are buildings, trees, hills and other objects that would also block and reduce some portion of the thermal pulse, often completely. In fact, the more densely built up an area is then the less likely the inhabitants would be exposed to suffer the full impact of the thermal pulse. Of course, though, they may still have to deal with the resultant fires created by the thermal pulse and from any blast damage. 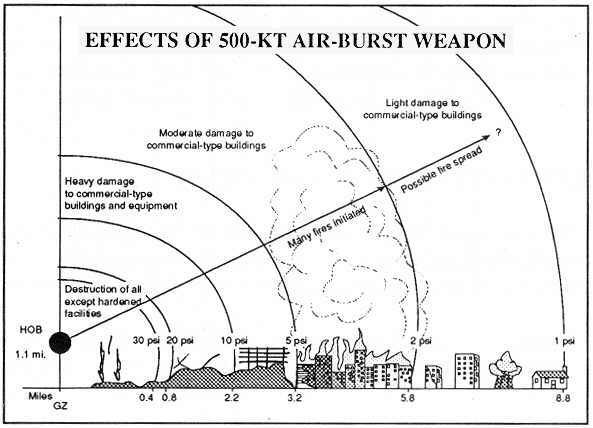 Another thing to keep in mind here, too, is the example above of a 500 KT bomb was an air burst. If it was a ground burst there would be far fewer ever directly in line-of-sight of the thermal pulse. �We have shown that common estimates of weapon effects that calculate a �radius� for thermal radiation are clearly misleading for surface bursts in urban environments. In many cases only a few unshadowed vertical surfaces, a small fraction of the area within a thermal damage radius, receive the expected heat flux.� � R. E. Marrs, W. C. Moss, and B. Whitlock, Thermal Radiation from Nuclear Detonations in Urban Environments, Lawrence Livermore National Laboratory, UCRL-TR-231593, June 2007, page 11. 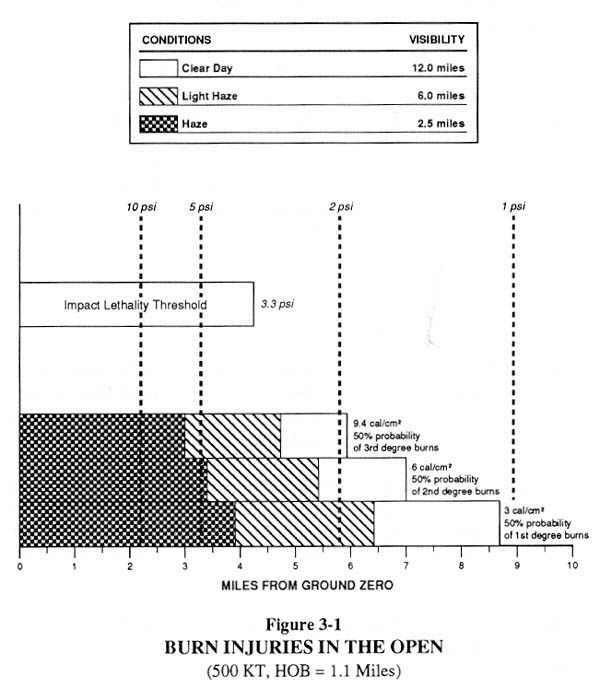 Another way to look at the odds (or risk) of your being in direct line of sight of an airburst fireball's random location at the time right when it goes off is to consider the following; while the airburst fireball could be at anytime and anywhere in the sky, it won't be everywhere, but only in one spot briefly when it happens, like the sun (or the moon at night) is at anytime in only one spot. Ask yourself, how often are you typically in direct view of the sun in the day or the moon at night? In a 24 hour day, with all the time you are typically in houses or inside at work, how often are you both outside with nothing at all shading you, but in the direct sunlight or moonlight? Whatever you answered, then that's the rough odds you'd happen to be fully exposed outside in direct line of sight of the fireball wherever and whenever it randomly flashed in the sky. If your answer was an hour a day, then odds are 24/1 in your favor that you'd likely be inside, or shaded if outside, and escape being in direct line of any flash, regardless where in the sky it randomly occurred or when. Make sense? 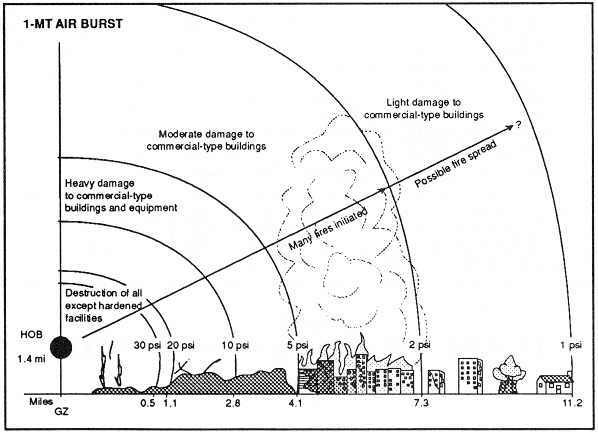 For a large 500 KT nuke explosion air burst (Hiroshima air burst was about 15 KT and terrorist nukes are expected to be even smaller) the lethal zone, for that 500KT bomb, would extend out to about 2.2 miles from Ground Zero (GZ), with overpressures at, or above, 10 psi inside that zone. Few survivors there, that were above ground at the time, as the blast, thermal pulse and initial radiation would have been far too intense. - Impact lethality out to just over 4 miles. - Impact skull fracture and serious glass wounds out to 5 miles. - Impact injuries out to over 6 miles, with 50% probability of 3rd degree burns, if in clear line-of-sight at the instant of initial flash. 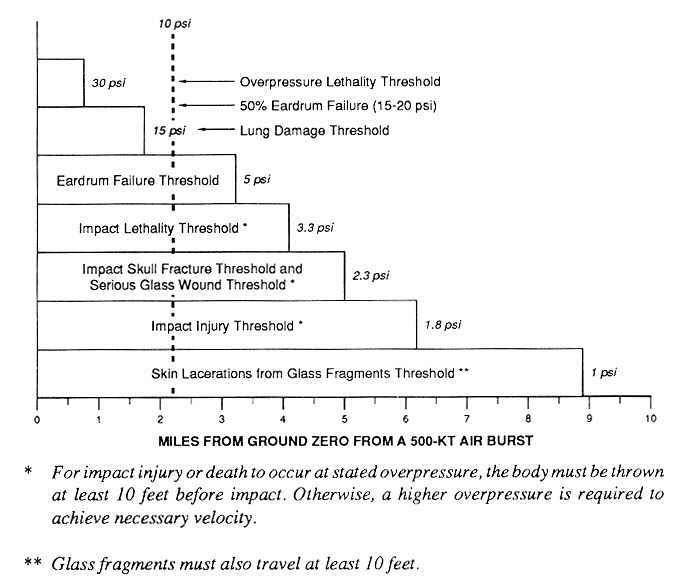 - Skin lacerations from glass fragments out to almost 9 miles, with 50% probability of 1st degree burns, if in clear line-of-sight at instant of initial flash. If the population was evenly distributed inside that outermost 9 mile radius from GZ, there are over 15 times more people beyond that 2.2 mile lethal overpressure zone, than were inside it. IOW, if there were 10,000 poor souls, now gone, inside that 2.2 mile lethal zone, there are over 150,000 more outside, still alive, but at grave risk IF they don't know what to do right! At that lethal zone edge of 2.2 miles out from GZ, the shock wave and wind blast will be arriving in about eight seconds after the initial flash. Everyone further out, those 15 times more people and families, will have even more time to 'duck & cover' and avoid becoming additional, unnecessary, casualties. BUT, ONLY IF they'd been trained beforehand in why, when, and how to effectively do so. If they die or are injuried, most all, as many as 90% or more, will have needlessly, out of ignorance of what to do from that very first second of the flash onward! And, regarding fallout later, which we cover next, in Part 2, most won't have time enough to move away or perpendicular from the downwind drift of the fallout to get out from under it before it arrives. For those who can't evacuate in time, few know how quick & easy it is to throw together an expedient fallout shelter, which we cover in Part 3, to safely wait out the radioactive fallout as it loses 99% of its lethal intensity in the first 48 hours!! Bottom Line: The majority of Americans, even in a full-scale all-out nuclear war, would survive the initial blast and thermal effects of nuclear explosions, by having been far enough away, and for those who aren't, most in the affected area could survive, too, IF they knew what to do beforehand! 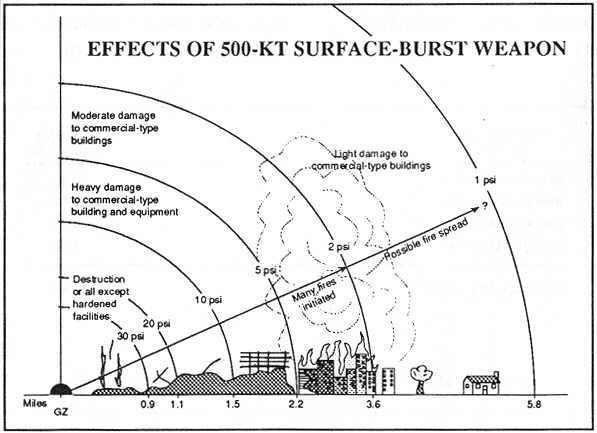 Even with a large 1 MT (twice the size of our 500 KT example above) explosion and being as few as 8-10 miles away from ground zero, you would likely find that you had survived the initial thermal and blast wave. With any kind of prompt protective action your odds of surviving at even half that distance are quite high. Also, increasing your odds, is that our military installations would be the primary targets and a multitude of thousands of purely civilian concentrations (cities & towns) would be of much less importance strategically to have wasted a nuke on in a first strike. (With the exception of our nations capital and militarily important targets in or adjacent to cities.) In a later section we'll explore more fully if you are likely residing at a probable 'ground zero'. Also, remember, with the much, much smaller expected yield and resulting blast damage area of a likely terrorist nuclear weapon, your odds of being in the wrong place at the wrong time are even more remote. PART 2 Continuing with "What are the Nuclear Radiation and Fallout Effects?" is HERE!